Silent Bob played the outfield with Combs and Ruth for six years and was a key member of the legendary 1927 Yankees. He was also suspended (along with Ruth) for participating in a non-authorized barnstorming tour. These are three integral reasons why Meusel’s name will live on in the annals of baseball history. He was born to Charles and Mary Meusel in San Jose, California, on July 19, 1896. Robert William was the youngest of their six children. The family later moved to an area in the vicinity of downtown Los Angeles. He attended the second Los Angeles High School, which was located on Fort Moore Hill. Meusel then went on to play for the Northwestern League's Spokane Indians (April-May 1917) and the Pacific Coast League's Vernon Tigers from 1917-1919. This excluded most of 1918, due to military service in the Navy. He accumulated 221 hits and 14 home runs to help the Vernon club win the 1919 championship. Those formidable stats helped propel him to the majors. Meusel spent ten seasons with the Ruthian Yankees from 1920-29. His last big league season was with Cincinnati in 1930. His career batting average was a solid .309. He hit a modest .225 in six World Series and slammed 156 career home runs. Meusel was a member of the champion Yankees of ’23, ’27 and ’28. He was only topped by three players in RBIs for the 1920s (Ruth, Rogers Hornsby, Harry Heilmann). Also, he was only topped by four players in home runs for the same decade (Ruth, Hornsby, Cy and Ken Williams). These rankings help to illustrate the greatness of Meusel as an offensive threat. His value as a fielder was outstanding, too. Languid Bob (as writers sometimes called him) had one of the best outfield arms ever—in the same class as Roberto Clemente, Carl Furillo, Willie Mays, and Ichiro Suzuki. He could whip the ball with lightning-fast speed and laser-beam accuracy, to any base or home plate. Meusel’s throws were usually caught on the fly, rather than on a bounce or two. He developed his arm strength as a kid by constantly throwing stones for long distances. Meusel got the appropriate nickname Long Bob for his 6’ 3” lean frame. He is the only American Leaguer to thrice hit for the cycle. The first came against Walter “Big Train” Johnson on May 7, 1921. The second one was against two largely unknowns in the A’s Jim Sullivan and Charlie Eckert on July 3, 1922. (Neither of them ever won a big league game.) The hat trick was achieved by benefit of a twelve-inning game on July 26, 1928. He holds the all-time record by twice stealing home in the World Series. They came off twenty-game winners Art Nehf (1921) and Jesse Haines (1928). His older brother was the Giants’ Emil “Irish” Meusel (of German descent), who four times drove in over 100 runs. One of their greatest thrills was opposing each other in three straight World Series from 1921-23. Their families during that time lived in the same apartment building in New York. The brothers had somewhat similar career statistics. For example, they both played eleven years, with one batting .310 and the other .309. They were the first siblings to combine for fifty home runs in the same season (1925). They were also the only brothers who both won RBI titles. Incidentally, Casey Stengel met his lifelong wife, Edna, through Mrs. Irish (Van) Meusel. Long Bob hit .328 for the Yankees as a big league rookie in 1920. Another newcomer to the club that year was George Herman “Babe” Ruth. Despite their personality differences, they both enjoyed the nightlife and became friends. However, the flamboyant Bambino wasn’t part of any social group on the team and usually went his own way. On the other hand, Meusel was known for having an extremely quiet demeanor and nonchalant style of play. Manager Miller Huggins described him as only appearing to be indifferent. He showed the same emotion regardless of whether the team won or lost. Several players and writers described him as anti-social. Meusel's conversations sometimes only included the words "Hello" and "Goodbye." Still, he wasn’t the type to be easily irritated and disrupt team chemistry. Fans often mistook his skillful, effortless work for loafing. His long, loping strides in fielding the ball helped to give them that impression. Meusel married Edith Cowan on December 14, 1921. The couple would have one son (born 1923) and one daughter (born 1938). He helped the Yankees win consecutive pennants from 1921-23. They faced McGraw’s Giants in the post-season all three years. Meusel, Ruth and second-string pitcher Bill Piercy were suspended for going on a barnstorming tour after the 1921 World Series. This practice was prohibited back then for players who had just participated in a World Series. These three teammates were warned beforehand but still went ahead with their trip. (Carl Mays and Wally Schang took notice and backed out.) Commissioner Kenesaw Mountain Landis had been in office for less than a year and felt that his authority was being challenged. Therefore, Landis came down fairly hard on the defiant players by ruling them ineligible until May 20, 1922. Executives, fan groups and others unsuccessfully attempted to have the penalties lessened. The Yankees won their first Fall Classic in 1923. Meusel delivered an eventual game-winning two-run single in the decisive Game Six. It was their inaugural season at The House That Ruth (or Ruppert) Built. Meusel and Tony Boeckel (Braves’ starting third baseman) were involved in a three-car accident near San Diego on February 15, 1924. Boeckel suffered critical injuries and died one day later, despite undergoing an operation. Meusel escaped from the mishap unscathed. Their driver was Los Angeles theatrical man Bob Albright, who received minor injuries. The three were returning from a hunting trip in Mexico. Later that year, on June 13, Meusel helped ignite a riot against the ferocious Tigers at Detroit’s Navin Field. The Yankees were leading, 10-6, when Bert Cole’s pitch nearly flattened Babe Ruth. Cole then proceeded to nail Meusel in the ribs. Silent Bob (usually) sprinted toward the suspected beanball thrower and took a swing at him (but missed). It set off a free-for-all between the players, along with a heated confrontation between Ruth and player/manager Ty Cobb. Umpire Billy Evans tried to restore order by tossing out Meusel and Ruth. But then scores of unruly fans stormed the playing field, and fights started breaking out all over. Therefore, Evans forfeited the game to New York. One of the all-time greatest outfields was Combs, Meusel and Ruth, which reigned from 1924-29. Meusel and Ruth would alternate positions, depending upon the individual ballpark because Ruth wanted to avoid facing the glaring sun. For instance, Ruth played right field in Yankee Stadium, since the sun shone on left field. The situation was reversed at Fenway Park. Meusel won the American League home run (33) and RBI (138) titles in 1925. That was the year in which Ruth suffered The Bellyache Heard ’Round the World. It was likely caused by his excessive late-night carousing, rather than by downing too many hot dogs and soda pops. The distracted Yanks plummeted from second to seventh place in 1925. After that season, Meusel never again reached such lofty heights in home runs. Manager Miller Huggins reshuffled the Yankees and brought them back to greatness in 1926. A noticeable change was their middle infield combo of Pee Wee Wanniger and Aaron Ward, who were replaced with Mark Koenig and Tony Lazzeri. This revamped team won the pennant, but lost the World Series to Rogers Hornsby’s Cardinals. In a famous pitcher/batter confrontation, Alexander whiffed Lazzeri with the bases loaded in Game Seven. Combs, Gehrig and Meusel were all straddling the base paths at the time. Meusel was at bat when the game ended two innings later on Ruth’s failed steal attempt of second base. Meusel batted .339 and stole 24 bases (topped only by Sisler in league play) with the fence-busting 1927 Yankees. His speed was exemplified by stealing second, third, and home in the third inning of a game on May 16. This team’s best hitters were known as Murderers’ Row. Gehrig, Lazzeri, Meusel and Ruth each had over 100 RBIs in 1927. Ruth, Gehrig, and Lazzeri were the league’s top three home run hitters. Combs led the league in hits and triples. Often overlooked was the Yanks’ pitching staff, which led both circuits in ERA. This well-rounded team from the lower Bronx is traditionally regarded as the finest ever. They capped off their fantastic season by sweeping Pittsburgh in the World Series. The Pirates’ top batsmen included Pie Traynor, Lloyd Waner, Paul Waner, and Glenn Wright. They also had nineteen-plus game winners in Carmen Hill, Ray Kremer, and Lee Meadows. 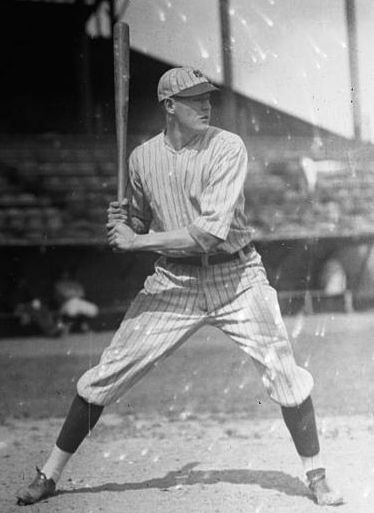 Meusel accumulated over 100 RBIs with the Yankees for a fifth time in 1928. Nine players from this team would eventually make the Hall of Fame. (Waite Hoyt strongly believed that Long Bob belonged there, too.) They won the pennant that year, and then swept St. Louis in the World Series. His numbers tailed off in 1929. Hence, he was waived to the Reds for a last hurrah on October 16, 1929. Meusel’s new teammates included future Hall of Famers Leo Durocher, Harry Heilmann, George Kelly and Eppa Rixey. He returned to the minors with Mike Kelley’s Minneapolis Millers (1931) and then the original Hollywood Stars (1932). The latter team played their home games at old Wrigley Field in Los Angeles until moving to San Diego for the 1936 season. Meusel participated in the Lou Gehrig Day ceremonies of July 4, 1939. It was held between games of a doubleheader with Washington. The current and former Yankees lined up along their designated areas in the infield (also the visiting Senators). Meusel stood with the veteran guard of Benny Bengough, Earle Combs, Joe Dugan, Waite Hoyt, Mark Koenig, Tony Lazzeri, Herb Pennock (his old road roommate), George Pipgras, Wally Pipp, Babe Ruth, Wally Schang, Everett Scott, and Bob Shawkey. The guest of honor received numerous gifts, ovations and tributes. And then the trembling Iron Horse gave his emotional speech. Its famous line: "Yet, today, I consider myself the luckiest man on the face of the earth." Silent Bob had cameo appearances in Slide, Kelly, Slide (1927), Alibi Ike (1935), Pride of the Yankees (1942) and The Babe Ruth Story (1948). His scenes in Pride of the Yankees included one with Gehrig alone inside the team's locker room. Two well-dressed players (followed by others) suddenly walked in. Meusel is the tall one wearing a fedora hat and smoking a cigarette. Another scene was when Wally Pipp had to leave the game due to seeing double vision. Meusel is leaning directly behind Ruth in the dugout. He worked for many years as a security guard at the former U.S. Navy base in Long Beach, California. Meusel was a longtime Redondo Beach-turned-Downey resident who died at Bellflower’s Kaiser Foundation Hospital on November 28, 1977. His wife, daughter, and son survived him. He was interred at Rose Hills Memorial Park in Whittier, California. An extremely memorable benefit game took place at Southern California’s old Brea Bowl, a natural amphitheatre, on Halloween of 1924. It was a pitch-fest billed as Babe Ruth vs. Walter Johnson, who grew up in Olinda (now Brea) and attended Fullerton High School. Businesses from afar were closed on the day of this much-heralded event. Johnson’s notable teammates included Jimmy Austin, Ernie Johnson, Bob Meusel and Ken Williams. Ruth’s included Sam Crawford, Rube Ellis, Harvey McClellan and Carl Sawyer (who also entertained the masses). The Bambino batted cleanup (naturally) and pitched the entire nine innings. The Big Train was lit up and took the one-sided loss. Ruth twice went deep, much to the fans’ delight. Crawford and Meusel each banged one out as well. The umpires were former slugger Gavy Cravath, youngster Beans Reardon and two others. Sportswriter Christy Walsh was in attendance. The crowd estimates varied from five to (an improbable) fifteen thousand. Baseball Magazine 6-24 p. 311, 8-26 p. 409. Downey Herald American, 12-4-77 p. 633. Downey Southeast News, 11-29-77 p. A1. Los Angeles Times, 2-16-24; 2-17-24; 6-14-24; 11-1-24. New York Times, 10-17-21; 2-16-24; 6-14-24 (pp. 1, 8). Sporting News, 2-21-24; 6-19-24; 7-13-39. ESPN Baseball Encyclopedia, Gillette & Palmer eds. 2005. Judge Landis and 25 Years of Baseball, Spink (ghost written). 1947. One Thousand and One Fascinating Baseball Facts, Nemec & Palmer. 1994. Reach Official American League Baseball Guide, 1918-20. The New York Yankees, Frank Graham. Putnam, 1958.